It’s very easy to overlook the utility of a monitor stand, but your multi-monitor desk setup is somewhat incomplete without it even with the best monitors in the world. Triple monitor setups are a common tool amongst professionals and gamers alike. Having a triple monitor boosts productivity and creativity for people who value screen real estate (Source). A good triple monitor stand should be comfortable, easy to setup and assume a variety of positions to improve the viewing experience of the user. Most modern Computer or TV monitors have the ability to swivel, tilt, and rotate to a certain degree. This makes them easier to work with whether you are playing a Witcher 3 or editing 4K footage. Such monitors, however, have a rigid design, and their maneuverability is somewhat limited. A monitor stand pushes flexibility and comfort to another level, allowing the user to fit larger screens and still remain firmly secure. Additional features such as VESA mounts and a strong base make the installation even safer, as monitors are a high-capital investment. Whether you’ll be using your monitors for gaming or for professional use, we will examine the top triple monitor stands for the money. 18 How High Should my Monitors Be? 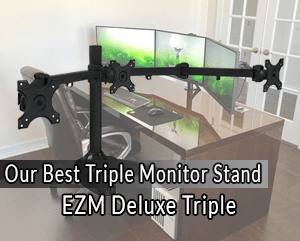 The EZM Deluxe Triple monitor stand is capable of supporting up to three 28-inch monitors. These come with a standard VESA mount and easy release mounting brackets for quick attaching and detaching of monitors. 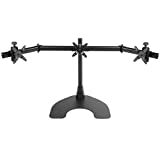 This monitor stand is capable of rotating up to 360 degrees and tilting 30 degrees in either direction to offer the best viewing angles regardless of your sitting position. What’s more, the height is also adjustable along its pole. The weight of your monitors won’t be a problem because the EZM Deluxe Triple stand comes with a heavy-duty stand that can also be fastened to your desk for additional security. Weighing in at 31 pounds the stand is not very lightweight and would be ideal for thick and hefty desks. This stand works for both large and small monitors, but you are better off with monitors of the same model due to its limitations in adjustment. The simple design of this stand makes it relatively easy to use and also doubles as an excellent budget pick aside from being our best general triple mount monitor stand. Most users prefer their multi-monitor setups a little static, but from time to time, you will need to adjust things a little bit. The AVLT-Power Premium stand offers incredible flexibility thanks to its piston-powered hinges. Gas powered pistons offer the perfect mix of flexibility and stability; they are easy to manipulate and stay in place when you let go. This feature alone makes this monitor ideal for people who read a lot on their monitors as they can easily switch between landscape and portrait mode. Those who prefer a ‘cockpit’ desk setup will appreciate the outer arms that can extend inwards but will be somewhat limited by the center display’s screen size. The finish looks great and would work magic whether it’s for your home office or office desk. One major drawback that we encountered with this monitor stand is the plastic tabs included in the integrated cable management system. They snap easily and are a let off considering the overall appearance of the monitor stand. Like the EZM Deluxe Triple Monitor Stand above, this monitor is not meant for particle office desks. The Ergotech Triple Horizontal monitor stand is capable of supporting up to three monitors of 24 inches each. The stand is can hold up to 75 pounds of monitor weight and is able to manipulate the monitor position in order to improve your viewing experience. The stand pivots 10-degree up and 20-degrees down, rotates to a full 360-degrees and can also tilt 25-degrees to the right or to the left. The installation procedure is a breeze thanks to the VESA mounting points. For stability, Ergotech Company ensured that you wouldn’t have to drill through your desk by providing a secure hefty clamp that should hold your monitors firmly. Your cabling troubles will be dealt with via the plastic clips that provide a tangle-free office desk setup. The stand’s weight is 27 pounds. This makes it imperfect for light desks but improves the firmness of the entire desk setup for large desks. In addition to the weight of the stand, the monitor weights could take the overall weight close to 100 pounds. This modular stand may not be ideal for everyone, but it holds its own for superb value, easy installation, unparalleled flexibility. It should be up there as one of your top choices. Crafted from high-grade steel and aluminum the Jestik Horizon Triple Monitor Mount will surely turn heads anywhere it is installed. This triple monitor stand has an incredible quality build with no plastics except for the three adjustment knobs. The knob material is somewhat irrelevant because it only serves to adjust monitors and bears no weight. 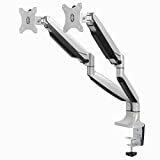 Outstretched, the three arms are capable of supporting a maximum of three 27-inch monitors that weight 17.7 pounds each. The stand comes with a condensed design that makes it consume less space but remains as sturdy as advertised. Jestik include a detailed instruction manual to make sure that you set up the stand in one round only. Additionally, the quick release feature also helps in making the installation process very simple. If security is an issue, you will be pleased to hear that the monitor stand comes with an anti-theft kit that makes the monitors firm and secure. Tangled cables can be a mess and are frustrating to look at; Jestik Company is aware of this and includes a neat cable management system in the box. Overall, despite the large base of this stand, it still manages to be the top pick for many users because of its outstanding build quality. None of the triple-monitor stands reviewed above is capable of holding monitors larger than 27 inches but his one can. With a double freestanding column, the Amer AMR3S32 is capable of holding up to three 30-inch displays without breaking a sweat. The stand’s solid construction makes this possible through clamp and grommet mounts and the two main feet. The VESA mounts on this stand also support the 120mm TV plate, which is a rarity at this price point. When fully installed the whole setup can g up to 6 feet in length, which calls for a massive desk to support it. For additional safety, we recommend that two people be involved in the setup as it can be quite cumbersome for one. There are a variety of areas where a supportive stand need’s to excel before it is considered a top product. We have outlined the essentials below. There are basically 3 distinct ways to mount your triple monitor stand; clamping it to your desk, mounting it to a wall or allowing it to stand on the floor. The type of installation you prefer will boil down to your personal preference and or the location of your desk. If you happen to shift (together with your desk and monitor) a lot in the office, then a desk clamp stand will serve you better. If your desk is very precious and you do not want to cause any damage with a clamp then go for the wall-mount. The mounts which stand on the floor are best for those working with oversized monitors. Keep in mind, these monitors are often larger than 30 inches. This is an excellent option if your desk cannot support the weight of three monitors. Additionally, this may be an excellent option if you are in a temporary space or will be enjoying your triple monitors from a low seat. Before choosing a monitor stand, consider checking the weight of all the three monitors you possess and the weight ceiling of the stand. Your desks weight limit will be indicated on the user manual. Check your desk’s weight limit versus the combined weight of your monitors, stand, and any other items placed on your desk. Failure to do this might cause everything to come crashing down immediately after installation plunging you into financial turmoil. As much as triple monitor stands are built to accommodate three monitors manufacturers put weight limits on the display sizes supported. Most triple monitor stands support monitor sizes of 15-inches minimum all the way up to 50-inches or more. This is where the fun begins! While most will be comfortable with a one-arm monitor stand, there are options for two, three, four or even six monitor setups. Sure, single monitors are usable, but multiple monitors are much more usable and fun in the process. For a two-monitor setup, you will need a dual monitor stand, for three monitors a triple monitor stand and so on and so forth. You want a monitor stand that is both static and dynamic. Dynamic meaning that it provides convenient viewing angles for the viewer by swiveling, tilting, and rotating. A quality monitor stand is also static enough so that it stays in one position once adjusted. Before buying a monitor stand or even a monitor for that sake, make sure that it is VESA compatible. VESA (Video Electronics Standards Association), have set universal standards on how monitors, TVs, and flat panels are mounted. Generally, VESA compatible stands range from 50 to 100 square millimeters. Simply put, the VESA standard is an arrangement of screws, holes, and plates that allow you to connect monitors to the arm and are categorized in terms of their weight limit. It’s unfortunate that you will get a few products in the market that are VESA incompatible. The good news is that there are adapters to help get around this, bad news; this solution is not guaranteed. Computer monitors vary in sizes and range from 13 all the way to 40 inches plus. Why should you note the weight of your monitor? One, you need to check for VESA compatibility weight limits and your monitor needs to be within the carrying capacity of the stand’s arm. Before buying your monitor stand, ensure that the VESA compatibility is in harmony because there are different levels to it. Secondly, you want to make sure that the arm is able to hold the monitor. A standard arm should accommodate monitors of up to 27 inches. These weigh somewhere in between 12- 25 lbs. but if you want to install something bigger, you are better off with something more robust like the Amer AMR3S32. Monitor stands have screen size recommendations that make them ideal to work with. Screen sizes vary from 15 all the way to 50+, so it’s important to know what screen sizes can be accommodated by your stand and how many of them. If you are involved in gaming, you will certainly want a larger screen size. This often means that your screens will weigh more and thus will need a sturdier mount. Additionally, you may find yourself needing more options for swiveling, so be aware of your needs. 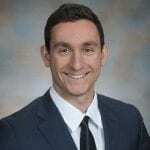 If you are purchasing these screens for an office setting, you should only need standard screen sizes, and you will probably not need as many angle options. Taking into consideration the smaller screens, a desk monitor stand will most likely suffice. Directly related to the weight of the monitors, the monitor screen size range supported are dictated by the stand manufacturers. A final thought on screen sizes. There are also screen stands with the option to hold laptops as one of the screens, or all of the screens. This is another incredible option, as it allows you to take one of your screens with you when you leave your desk or station. It also allows you to stand and type while looking at all three of your screens. Do not underestimate the power of the triple laptop stand. 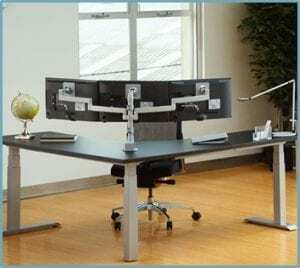 The price is minimal for triple monitor stands but the biggest save you will make will be in terms of posture improvement and overall workplace health. As with everything you need to buy, stick to your needs and your budget. Another consideration is how you want your screens to sit beside each other. The most common set-up is a side by side approach. This provides you with the option to have the screens function as one screen or three individual screens. Having these options as a gamer or as an employee is excellent. However, you could also purchase a vertical monitor stand. This would allow your monitors to stack on top of one another vertically. This may be ideal if you are editing photos or if you are in a job where you sit and stand often. Finally, you may want to consider a stand which allows you to do any of those options. These stands have arms which are equipped to move and manipulate your screens. It can be incredibly helpful to move your screens, especially if you are sharing your computer with many other people. How High Should my Monitors Be? This is a tricky question, one which we will not answer in terms of inches or feet. Instead, we will answer in relation to your eyes. The simple answer is to keep your monitors at an angle and height which is comfortable for you. However, there is some science behind the correct angle and height to keep your eyes and neck healthy while you work. First, the monitors should be just at arm’s width from you. Any closer and I’m afraid it will be challenging for your to see the screens appropriately. Additionally, test your monitor height by marking the middle of the screen with a small piece of painter’s tape. Then, take note of how you feel when you are looking at the center of the screen. Do you feel that you are looking straight ahead? Up? Down? Hopefully, your answer is down. It has been found that it is best for the eyes and the neck to be slightly tilted down when looking at a computer screen. Well, if you reached this far then kudos! Monitor stands have a lot of intricate details that one has to pay attention to. Having gone through the buyer’s guide above, rest assured that whatever stand you will buy will come with no hidden surprises. If you are aware of what type of stand you are looking for, the comfort you desire, your desk’s weight limit and weight of your monitors then you will find something great. Overall, you want to find something that eases your everyday use, improves your posture, and relaxes your eyes when working or gaming. What’s your preferable monitor stand for the perfect triple monitor setup? Please let us know in the comments section below.